If you’re among the 14% percent of American adults who suffer from regular constipation, knowing how to relieve constipation fast will come as some valuable information. Thankfully, home remedies for constipation are abundant and effective, and typically relieve symptoms within a few hours or days. Knowing how to cure constipation is central to understanding how your body works and how various decisions you make each make day can either help or hinder the discomfort accompanying this condition. Constipation is rather common and affects people of all ages at some point, though some experience it more frequently than others. Put simply, being constipated means stool is not passing through your bowels in a timely or effective manner. The stools can be hard, dry, or require straining to pass, which can lead to stomach pain, pain while defecating, and unusually shaped stools. Knowing how to relieve constipation quickly and how to get unconstipated can save you much pain and discomfort and increase your quality of life. Constipation affects everyone differently. What we can consider a “normal” rate of bowel movements extends anywhere from three times per day to three times per week, and really depends on individual symptoms and comfort levels. Age, anxiety, and depression can also impact a person’s susceptibility to the condition. Fortunately, most constipation treatment for adults can be done safely at home. When talking about immediate constipation relief, it’s important to have some patience. It takes some time for these remedies to get things moving through your system, so the impact won’t be as quick taking a “Tylenol” for a headache, for example. Most of these natural remedies for constipation will take a few hours or days to bring relief. However, these treatments for constipation have the potential to offer long-lasting benefits because they are, in effect, lifestyle-based. Drinking water—in fact, drinking a number of liquids—can help relieve constipation by softening stool and moving it through your intestines and bowels. Let’s take a look at how to get rid of constipation fast by boosting fluid intake. Drinking more water throughout the day is one of the first things you should do if you’re feeling constipated. How does drinking water help constipation? As noted above, water helps soften and loosen stool and carry it through your digestive tract. Research has indicated that drinking water daily— usually eight glasses—helps improve the frequency and consistency of bowel movements without bloating, pain, or unbearable urges to run to the bathroom. For a high-fiber diet (the best way to get unconstipated) to be effective, it needs water to work. Simply adding a few glasses of water per day may be all that is needed for immediate constipation relief. Coffee may be the best fluid to help relieve constipation. Research and plenty of anecdotal evidence has suggested that coffee works great as a laxative. It’s possible that the caffeine and potentially other exclusive compounds stimulate a motor response in colon muscles that causes both contractions and relaxations, which aid the passage of stool. It might not work for everybody, but drinking a cup of caffeinated, black, and unsweetened coffee every morning may help clear up constipation. Although it may seem like carbonated beverages could worsen the symptoms of constipation by promoting bloating and stomach pain, they can actually help in certain populations. Specifically, research has shown elderly patients that were bed-ridden following a cerebrovascular accident showed significant benefits from carbonated water. Compared to a group drinking tap water, the results showed carbonated water led to significant increases in defecation frequency and significant reductions in constipation over the two-week study period. Another study showed that carbonated water was helpful treatment for constipation among people with functional dyspepsia (indigestion). How fast does prune juice work? It’s hard to say and will all depend on your metabolism. What may make prune juice effective—though there is no guarantee it will work—is the presence of sorbitol, which may offer laxation. There are also high-fiber foods to relieve constipation. The food you eat plays a huge role in determining gut health and the quick, comfortable passage of stool through the digestive system. In fact, changing your diet may be the most useful natural remedy for constipation. Something to keep in mind if you’re wondering how to cure constipation is that, generally speaking, processed foods are bad for you. These items are usually free of fiber, a non-digestible, plant-based nutrient that is ultimately the main ingredient to keep stool moving through you. White breads, cakes, and candies are not only dangerous for your health, but do virtually nothing to promote healthy bodily processes, and are responsible for the low-fiber diets of many Americans. And although meats and dairy are not necessarily bad for you, they, too, are not good sources of fiber. So, where should you get it? This is where you’re going to get your fiber. Daily recommended allowances for fiber are between 25 and 38 grams (the former for women; latter for men) per day, which can be reached quite easily by eating a wide variety of fruits, vegetables and whole grains. Basically, if it comes out of the ground or from a tree, it is probably a decent source of fiber. One thing to keep in mind, though, and this is especially true with berries or apples: eat the skin. Don’t put them in a blender for a smoothie, because you’ll lose the fiber. Fiber is found in the skin and flesh that holds these foods together, and liquefying it eliminates the presence. Lastly, to get the benefits of fiber, you will want to drink plenty of water. Fermented foods are rich in probiotics—good bacteria—that may help improve gut health and relieve constipation. Kefir, yogurt, kimchi and pickled items all feature probiotics and are great additions to a healthy diet. Supplements are also available, but there is not enough research to make recommendations as to whether or not they offer benefits. Some studies and reviews have noted that probiotics render improvements in the number of weekly bowel movements, helping to soften stool and make it easier to pass. It’s advised to experiment on your own using supplements featuring Bifidobacterium. They are unlikely to cause harm even if they don’t offer constipation relief. Fiber supplements: These add bulk to your stool and include ingredients like psyllium (“Metamucil”), calcium polycarbophil, and methylcellulose fiber. Stimulants: The bulk-forming medicines cause intestinal contractions and include chemical compounds like bisacodyl and senna-sennosides. Osmotics: These help fluids move through the colon by attracting and retaining water (i.e. magnesium hydroxide, magnesium citrate, lactulose, polyethylene glycol). Stool softeners: The laxative agents draw water from the intestines to soften stool, often featuring docusate sodium and docusate calcium. Enema: You probably want to go to a doctor for this. They will flush water into you to soften stool. The more active you are, the less likely you are to be bogged down by the discomfort of constipation. And although you may read about specific stretches to relieve constipation or even some yoga poses for bowel movement assistance, at the end of the day, virtually any form of physical activity will ultimately help stool pass through your body. So, if you prefer the less strenuous yoga, do it. If you like walking, jogging or dancing, that may help, too. The more time you spend up on your feet moving, the less likely you are to experience constipation. A sedentary life, on the other hand, makes constipation much more likely. The best way to include more activity into your life is to set up a routine. It could be going out for a walk with a friend two or three times a week, participating in a class at your local community center, or joining a yoga studio. Whatever it is, schedule it in so it becomes routine and you’re getting at least 150 minutes of exercise distributed throughout the week. It’s possible that constipation can be relived with breathing exercises. Constipation, in part, may be tied to tight stomach muscles caused by nerves. Deep breathing techniques, like diaphragmatic breathing and abdominal breathing can help stomach muscles contract and relax to effectively push stool through your bowels. Taking a yoga or tai chi class can help with deep breathing. However, the exercises may not be as effective if you’re not also eating enough fiber or drinking water. There is also a technique known as Kapalabhati Pranayama that may be effective to help get things moving. It’s a rhythmic breathing exercise centered around slower, two-second inhalations and quick, explosive exhales. When performing these breaths, sit up as straight as possible and cup your stomach when exhaling. This will help you feel the contractions as you burst the air out. Perform 20 to 30 cycles. Can You Experience Immediate Constipation Relief? Everybody wants to know how to relieve constipation quickly, but unfortunately, it is often a waiting game. Some methods will work faster than others. But by drinking more water, boosting your intake of fruit, vegetables and whole grains, and making more time for physical activity, you could have regular movements and relief from constipation long into the future. You just may have to wait a few days for it to start working. “Constipation,” NHS web site, December 24, 2015; https://www.nhs.uk/Conditions/Constipation/Pages/Introduction.aspx, last accessed October 17, 2017. 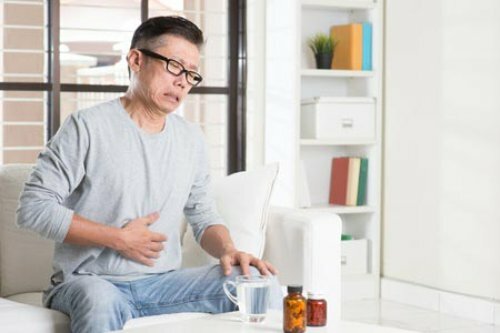 “Constipation and Impaction” Harvard Health Publications, January 2014; https://www.health.harvard.edu/digestive-health/constipation-and-impaction, last accesed October 17, 2017. Bae, S. “Diets for Constipation,” Pediatric Gastroenterology, Hepatology & Nutrition, 2014;17(4):203-208. DOI:10.5223/pghn.2014.17.4.203; https://www.ncbi.nlm.nih.gov/pmc/articles/PMC4291444/, last accessed October 18, 2017. Brown, S., “Effect of coffee on distal colon function,” Gut. 1990 Apr;31(4):450-3; https://www.ncbi.nlm.nih.gov/pubmed/2338272, last accessed October 18, 2017. Mun, J., “Effects of carbonated water intake on constipation in elderly patients following a cerebrovascular accident,” J Korean Acad Nurs. 2011 Apr;41(2):269-75. DOI: 10.4040/jkan.2011.41.2.269; https://www.ncbi.nlm.nih.gov/pubmed/21551998, last accessed October 18, 2017. Cuomo, R., “Effects of carbonated water on functional dyspepsia and constipation,” Eur J Gastroenterol Hepatol. 2002 Sep;14(9):991-9; https://www.ncbi.nlm.nih.gov/pubmed/12352219, last accessed October 18, 2017. Corliss, J., “Probiotics May Ease Constipation,” Harvard Health Publications, August 21, 2014; https://www.health.harvard.edu/blog/probiotics-may-ease-constipation-201408217377, last accessed October 18, 2017. “Constipation,” Mayo Clinic web site, October 19, 2016; https://www.mayoclinic.org/diseases-conditions/constipation/diagnosis-treatment/drc-20354259, last accessed October 18, 2017. De Schryyer A., et al., “Effects of regular physical activity on defecation pattern in middle-aged patients complaining of chronic constipation,” Scand J Gastroenterol. 2005 Apr;40(4):422-9; https://www.ncbi.nlm.nih.gov/pubmed/16028436, last accessed October 18, 2017. Hsieh, C., “Treatment of Constipation in Older Adults,” Am Fam Physician. 2005 Dec 1;72(11):2277-2284; http://www.aafp.org/afp/2005/1201/p2277.html, last accessed October 18, 2017.